An angle grinder refers to the power tool specially designed for polishing and grinding—ideal for abrasive cutting. Any sander wouldn’t be caught dead without an angle grinder. Cleaning metal pieces also require an angle grinder, so it is natural for a homeowner to have one in their household. You only need to buy an angle grinder once, so make sure that you choose the best angle grinder available in the market. To help you make the right decision, we have created a list of the top 10 best angle grinders available in the market today. The following are the most durable, highly-functional, and affordable angle grinders that can suit all of your needs. The Dewalt angle grinder features a brushless motor that can deliver up to 57% more run time compared to brushed motors. In that way, you can increase your productivity while using the product. Aside from that, you don’t need to worry about load speed. This angle grinder can provide up to 9,000 RPMS. It also features a blade brake when the paddle switch is released, making sure that the wheel will automatically come to a halt. Since it is powered by a brushless motor, it just means that you are no longer required to change brushes now and then. The angle grinder features an E-switch protection. For instance, if an unforeseen shut down occurs, the trigger switch will need to be cycled to restart tool. We like that this affordable angle grinder produces low vibration and dust containment. Buyers can enjoy up to three-year limited warranty upon purchasing the product. 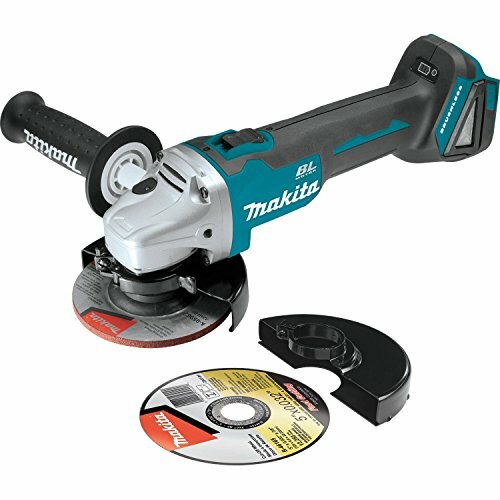 Next, we have the Makita angle grinder that features an automatic speed change technology. You can adjust both the speed and torque while operating to achieve optimal results. Aside from that, it also has an active feedback-sensing technology that will turn the motor off if the rotation of the wheel is stopped intentionally. Similar to the previous product we’ve reviewed above, it is also powered by a brushless motor that will eliminate the need for carbon brushes. Rest assured that the motor will stay cool even if you use it for continuous hours. This angle grinder allows you to save up to 50% of energy consumption with its longer run time per charge. The BL motor is electronically-control, allowing you to match the RPM and torque that you need for your work or project. The three-stage LED gauge indicates the level of a battery used and the slide switch with lock-on is designed for optimal operator experience. Next, we have the Milwaukee cordless angle grinder that features a paddle switch. In that way, you will not encounter any difficulty when activating this grinder. Regardless if you’re wearing thick working gloves or not, thanks to its smart design, using this product is a lot easier. The L-shape molding near the grinding wheel automatically picks up the debris. In that way, you can prevent the clogging up of debris and ruin the internal components of the tools. It features a three-position side handle that allows you to work with optimal stability. Its plastic handle is also included in the package. Thanks to its 18V lithium-ion Milwaukee batteries, you can increase your productivity because this unit can last for a long time before the battery drains. Its four-pole motor provides maximum power when cutting or grinding, allowing you to use the product in a variety of uses. 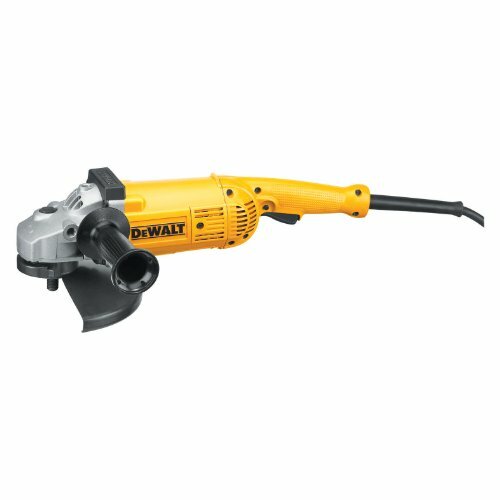 If you are looking for a large-sized angle grinder, check out the Dewalt angle grinder. It can provide high power 5.3 and 6,000 rpm motor with overload protection. This product is designed for heavy-duty use and higher operating speeds instead of simple DIY projects. It also features a keyless adjustable guard that provides guard adjustments without the need of tools. The epoxy-coated field and armature assure you that it can last for a long time with proper use and maintenance. It can also withstand abrasion from airborne debris. The rear handle of this tool can be rotated, allowing you to complete different grinding and cutting applications. It features an automatic turn-off brush that will shut down the tool when you need to change the brush. In that way, you can avoid damage in the long run. 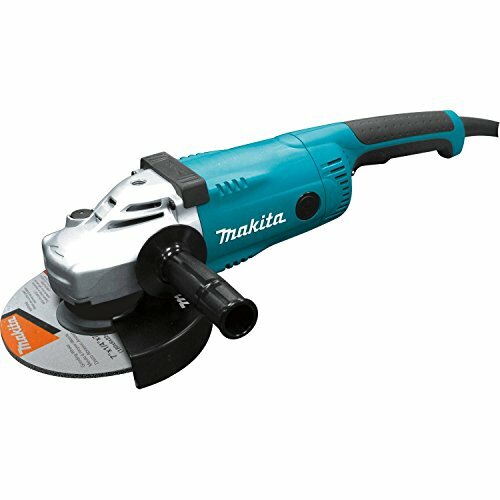 The Makita 7-inch angle grinder is powered by a 15.0-amp motor that can deliver more output to achieve desired results. Thanks to its labyrinth construction, it can seal and protect both motors and bearings from the dust and debris. Rest assured that this unit can last for a long time. It also features an ergonomic soft grip to provide optimal comfort while you are using the unit. The protective zig-zag varnish seals the armature from dust and debris for a longer service life of the tool. It provides optimal convenience thanks to its tool-less wheel guard adjustment that makes it easy to clamp. The AC/DC switch can be used as an alternative power source. Its dust-proof bearing prevents the dust and debris from entering and ruining the gears. Are you on a tight budget? Do not worry because we have listed an item for you! 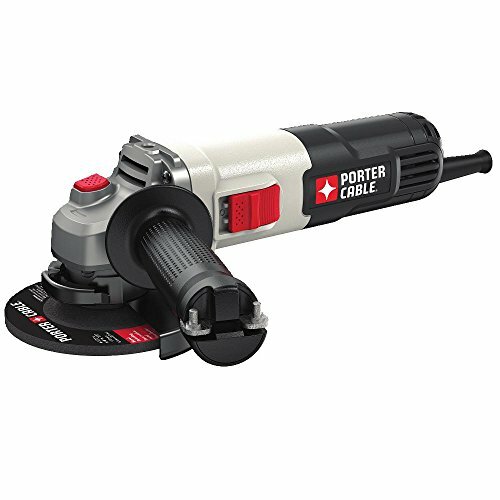 Check out the porter cable small angle grinder. It utilizes a durable 6.0-amp motor power that can do any job site tasks, be it for residential or commercial use. This angle grinder can provide up to 12,000 RPM for quick material removal, increasing your productivity as you work. It has cast metal gear case for increased durability and longer service life. The tool-free guard change provides a fast and easy adjustment when working. The three-position side handle ensures an optimal comfort even if you use the product at continuous hours. 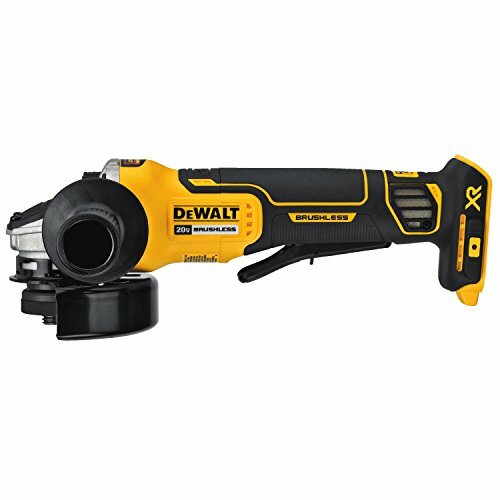 Another product from Dewalt is the 7-inch medium angle grinder. It is made of high-quality plastic and metal that can last for a long time. Thanks to its 13.0-amp AC/DC 8,000 RPM motor, you can enjoy the high power of the grinder in the long run and speed for various grinding applications. We also like its quick high power-to-weight ratio that can reduce the fatigue of the user when using the product. It has a keyless adjustable guard that provides a tool-free guard adjustment to increase your productivity and reduce the hassle. The rear handle design offers great comfort and full control of the device. There are external brush caps designed for easy servicing and sealed ball to extend the service life of the motor. 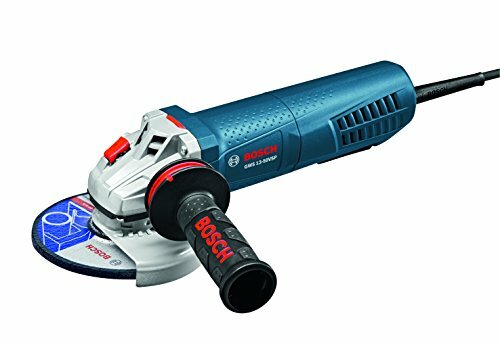 Bosch GWS13-50VSP High-Performance Angle Grinder Variable Speed with Paddle Switch, 5"
The Bosch high-performance angle grinder features a paddle switch for comfortable grip positions even with gloved hands. It features a powerful motor with 13 amps and up to 11,500 RPM. In that way, you can match the speed to the application of the tool. Since it uses a brushed motor, you are required to change carbon brushes. The direct-motor cooling is designed to accommodate higher overload capabilities. 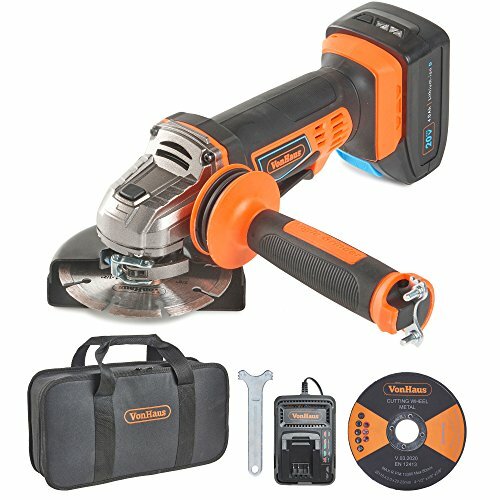 Now you can work in a variety of grinding projects thanks to this product. The integrated acceleration sensor limits the inadvertent recoil and restarts protection against unintended startup. It also features a two-position vibration control side handle for optimal comfort of the product. 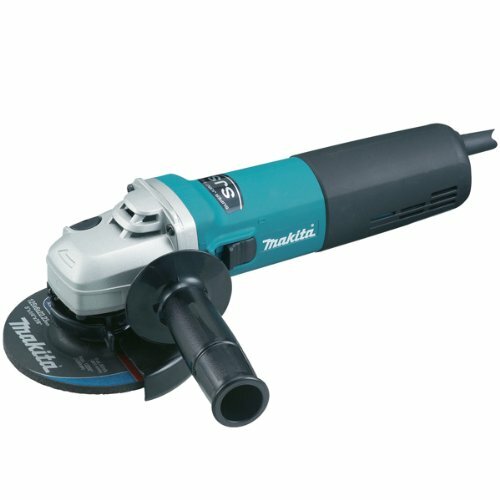 The Makita high-power angle grinder features a super joint system technology that can help you prevent gear damaged caused by accidental wheel binding. It also has a variable speed control dial that allows you to match the speed to the application of your work. Thanks to its powerful 12.0-amp motor, you can enjoy increased power in such a compact tool that only weighs 5.5 pounds. It has a soft start feature for smoother and hassle-free startups. Similar to other products from the same manufacturer, its labyrinth construction is designed to seal and protect the motor from dust and debris. In that way, you can enjoy the product for many years to come. The large and improved carbon brush material is designed for longer tool life. Lastly, we have the VonHaus angle grinder that features a premium high-spec motor that can run at 11000 RPM. No more load speed to provide the strong abrasive force. The diamond tipped disc comes with a storage bag for added protection. This cordless angle grinder is lightweight and easy to carry around. The package also includes a 20V max 4Ah battery that’s compatible with all tools from the same series. Thanks to its auxiliary handle, the vibration is reduced while working. It also offers great balance, control, and optimal comfort. It’s easy to remove and attach to either side. There is storage mounted on the handle designed for wrenches that make it easier to change the wheels.